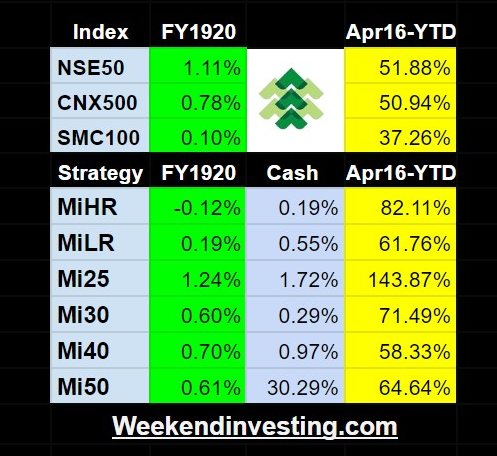 Mi30 is a weekly strategy that runs only on CNX500 stocks with the proven momentum Type A strategy as seen in Mi25 . The strategy will have around 30 stocks and has performed well in the historical back tests. The expected gross CAGR% over a medium term is >15-25%. The strategy suits PF sizes of 5-25 Lac. Mi30 can be followed as a subscription model for portfolio size up-to INR 25Lacs. Larger portfolios can run it on a variable fees basis with additional hands on support and priority signals.